Like winter’s frosty mornings, time can seem frozen still at this time of year. Dark mornings, cold days and bleak grey skies seem to dominate and give little hope of spring ever arriving. But now February is well under our belts, a few days of good sunshine has lifted our spirits and brought some welcome signs of spring. In the top courtyard pots, some dwarf bulb species are beginning to flower. Iris histrioides ‘George’ (AGM) has a particularly attractive rich maroon colour and this delicate little daffodil, Narcissus ‘Spoirot’ is a hybrid seedling from N. bulbocodium subsp. Bulbicodium var. conspicuus and N.cantricus subsp. Cantabricus var. foliosus, raised during the late 1980’s at Glenbrook bulb farm in Tasmania by a Mr. Rod Barwick. Not until 2011, did the RHS give it a well-deserved award of garden merit. 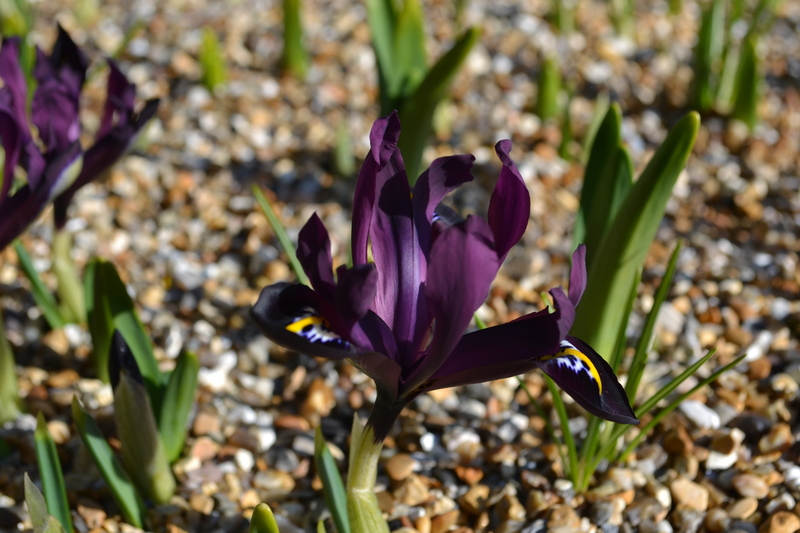 Iris histrioides ‘George’ in the Top Courtyard. 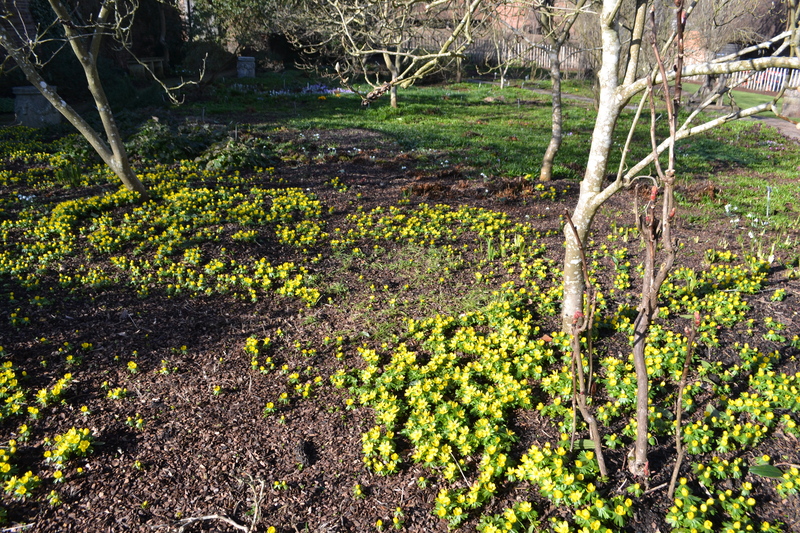 The winter aconites, Eranthis hyemalis (AGM) which have been flowering since mid-January never fail to lift the spirits. But, it is not until their bright yellow faces get some proper sunshine that they really begin to open fully and light up. Yesterday while we inspected our snowdrop collection, of which we have around 18 different varieties/species according to our records, we also began a debate about Crocus tommasinianus. 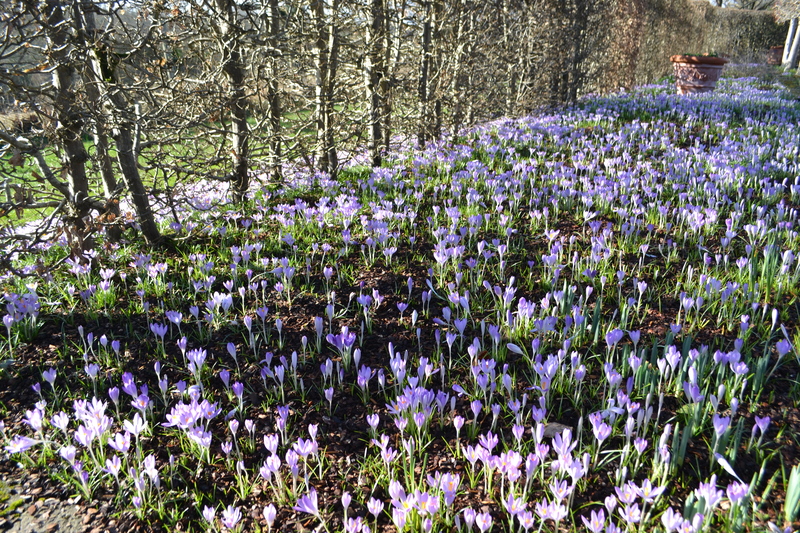 Crocus tommasinianus in the Lime Walk. Sometimes referred as the ‘Snow crocus’ and one of the earliest corms to flower. Crocus tommasinianus was named after a botanist and the Mayor of Trieste, Muzio.G.Tommasini. It is native to Bulgaria, Hungary and the former Yugoslavia. As you can see it has become prolific and has seeded itself extensively throughout the Lime walk and into the Nuttery. It is creating some controversy, because while on mass it does attract much admiration by volunteers and private guests to the garden during our closed time, it also has become cause for some concern. Tommasinianus has become a thug; a bully whose deep rooted corms and subsequent mat forming roots are in danger of out competing the healthy growth of neighbouring bulbs, which need all their strength to establish and flower at their best. Left unmanaged, I think it could engulf the whole garden eventually. Our solution is to be stricter from now onwards. 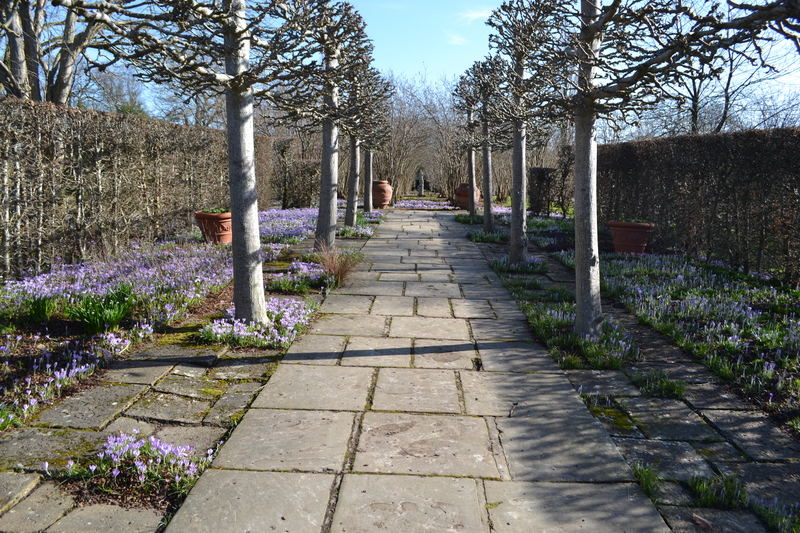 We must remove runaway seedlings which appear elsewhere in the garden, dead head to stop further seedling invasions and when areas of the Lime Walk are added to, we will try to remove as many crocus corms from the soil as possible. Before I dampen all our spirits again, by talk of invasive plants, here’s a pretty picture of a completely different character. 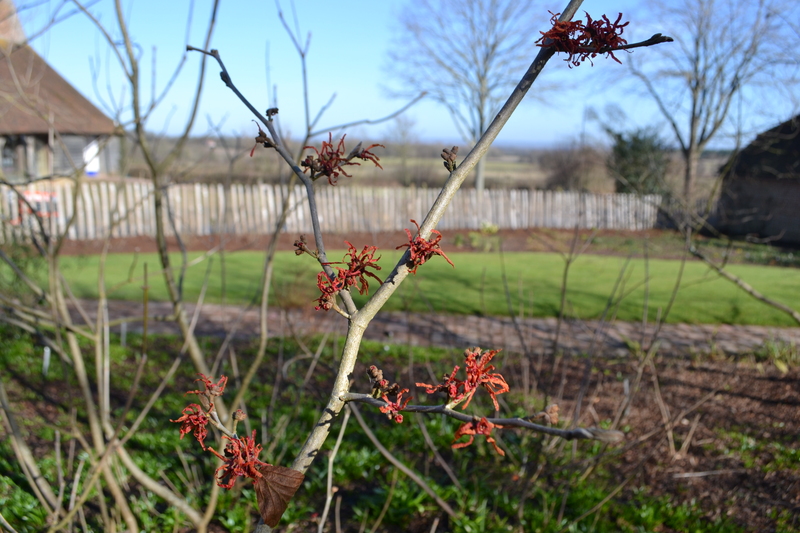 This is the lovely orange coloured witch hazel, Hamamelis x intermedia ‘Arnhem.’ Unlike the speed in which the aforementioned crocus takes over, this shrub is slow growing and minds its own business. It was a gift given to us in 2010 and in a year or two will branch out a bit more.